I know what you're thinking, your thinking my title is referring to a new "The Adventures of Sinbad" movie, you'd be wrong, although I wish they would make a new Adventures of Sinbad movie, the title is referring to the names of past and future meteor showers. 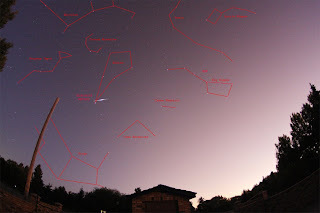 The image above is a Draconid meteor taken during the Dranconid meteor shower of June 29. I drew out the constellations for you to show you how everything fits in the night sky. 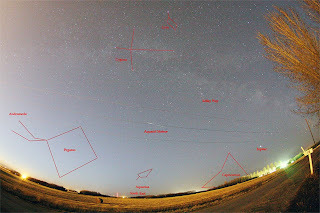 I did the same for the image below of the Aquarid meteor shower back in May. The showers were literally back to back, 180 degrees apart, gives you a good idea of the major constellations in the spring sky in the Northern Hemisphere. A point of interest, on the Draconid image I located for you the location where The Hubble Telescope was pointed for it's Hubble Deep Field image, (just above the arm of the Big Dipper). NASA trained Hubble on an area in the sky no bigger then the size of a dime at 75 feet, pointed the scope away from the dust and stars of our galaxy, and away from the Virgo, Coma galaxy clusters, in an area they thought would be pretty empty of galaxies. 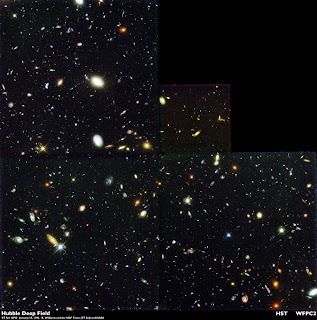 What they discovered was astounding, after stacking 342 separate images over 10 days between December 18-28, 1995, they found at least 1,500 galaxies in various stages of evolution of up to more then 10 billion years ago, image below. 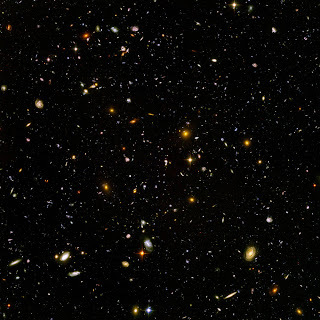 NASA thought that was pretty cool, so much so they thought they'd do it again, this time they aimed Hubble at a southern constellation Fornax, this time 800 images were taken over a 4 month time frame totaling 1 million seconds, this image is called the Hubble Ultra Deep Field and produced 10,000 galaxies, image below. Back to the meteor showers. August 11 through to the early morning hours of August 12 the Perseid meteor shower peaks, look for 1-2 every minute, should be a good one. The radiant, or the place in the sky where the meteors seem to start from, is in the constellation Perseus. look low in the NE at Sunset for the start of the show. NASA TV will be broadcasting live the Total Solar Eclipse Friday August 1 starting at 6:30 am EDT, that's right, hey it's 4:30 am where I live, I'll be up. The eclipse starts high up in North Eastern Canada, passes over Greenland, Russia, China and Mongolia. I vow to one day see a Total Solar Eclipse before I die, mark my words and if I still have a blog I will post tons of images, in the meantime it's NASA TV for me. I'll leave you now with a clip of the Milky Way Galaxy I put together, 70 images, each at 30 seconds exposure, real time 45 minutes. We at Black holes, and when I say we, I mean me, we sounds more important, like there is a group of us getting this stuff out, anyways me tries to get out something new and different with each and every post, this story certainly qualifies as just that. Just last week we had a break in one of our main water lines coming into the mall I work at, water was gushing out of the asphalt like a fountain, not good. So I call the city to come and shut off the water supply and phone around for a contractor to fix the break. Enter Bill Garrnet Industries LTD. 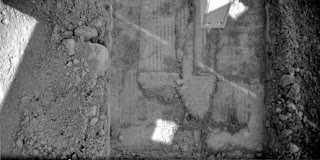 So we're digging away, and by we're I mean they're digging, digging this hole in our asphalt down to where we think the break may be, and it's getting bigger and bigger, still can't find the break, the hole is now around 10 feet deep by 40 ft long by 24 ft wide, and we're all getting grumpy, and by we're I mean we're, so to add some levity to the situation I says to Bill, "So Bill, ever found any human remains in all your digging adventures?" Bill looks at me and says,"No, but I have found a "Columbian Mammoth". So I look at Bill and start laughing, thinking he was joking, but he gives me that look like, no Bob I'm not joking, so I say oh, really, tell me more. They were on a dig back in '71 at Babine Lake BC when they dug down to a bunch of white stuff, they stop and go down in the pit to investigate, him and a friend dig out by hand a piece of what they thought to be petrified wood, report the find to their boss and then call it quits for the night and head back to their hotel. 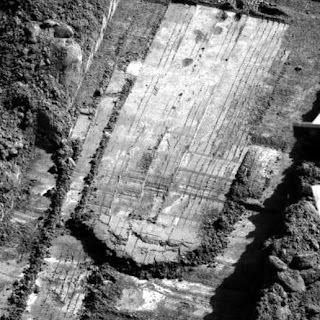 So they wake up the next morning, go to the dig to have some more fun, and WOW, there were helicopters, vans, trucks ,tons of people, the whole area was blocked off, the dig, or at least their part was over while the Archaeologists did their part. They found out they had discovered a Columbian Mammoth, how cool was that? Seems the piece they had dug out by hand was a Mammoth tooth. I was standing next to a person who found, not only found but touched a Mammoth's tooth. 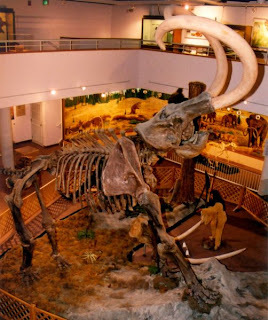 Radiocarbon tests put the age of the Mammoth at around 34,000 years. Quick update on the Phoenix Lander . 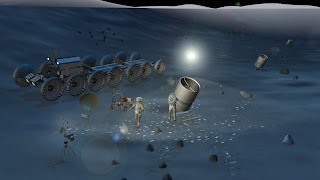 Two thirds of the way through the Lander's mission and they still haven't gotten some of that ice water into it's ovens for analysis, hopefully soon, will keep you up todate in future posts. I'll leave you now with a clip I put together of a July Moon Rise, this time I took 235 images 5 seconds apart from each other over a 19 minute time frame, to try and make the Moon Rise look nice and smooth. Last week NASA released the cool video above of the Moon passing in front of the Earth. Taken by the Deep Impact spacecraft from 31 million miles away. NASA says "Making a video of Earth from so far away helps the search for other life-bearing planets in the Universe by giving insights into how a distant, Earth-like alien world would appear to us". Deep Impact was the spacecraft that sent an impactor into comet Temple 1 July 4 2005. Deep Impact is now on it's way to rendezvous with comet Hartley 2 November 4 2010. The video below is something I wanted to put together for my one year blogging anniversary but never found the time to do so, well I've finally completed it. It is a compilation of some of my favorite images I've taken over the last year and then some. For the audio track I used Supertramp's song, Lord Is It Mine. No sooner had I posted it, within an hour or so, I got an email from You Tube stating "A You Tube Partner" UMG has claimed some or all audio content in your video "Lord Is It Mine", well unlike the title would suggest I guess it isn't mine, even though I've paid for it a gazillion times over through album, cd and itunes purchases. It also states that the video is still live because UMG has authorized it, that they have a claim on it and they will receive public stats and that viewers may see advertisements on my video's page, hey whatta ya gonna do. This of course begs the questions, how do you get permissions to upload a copywritten song, and how do you know if it is copywritten in the first place. So many questions, so little time, think I'll stick to easier things like the Cosmos, the last time I looked the Lord hadn't copywritten it. Anyways I hope you enjoy the video. At one time I had really big plans for the Sun and this blog, gonna post a lot of images and such, but alas the Sun has not been co-operating, nothing going on, little or no Sunspots, flares or prominences. I took the image of Sunspot 0999 above over a month ago. 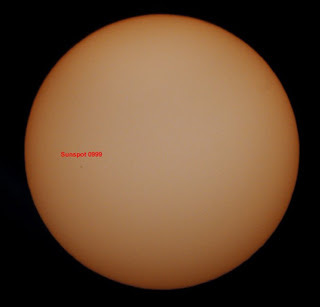 The image below is what was on Spaceweather.com today, actually been the same blank Sun for going on 6 weeks now. A little bit of solar background, the Sun's solar activity such as sunspots, flares and prominences goes through an 11 year cycle of highs and lows, we are currently on the extra long decaying end of cycle 23, in the next few months we will see more solar activity as the Sun builds to solar maximum around 2012. At solar maximum we can expect to see upwards of 120 sunspots and intense solar flares daily as well as auroras as far south as Florida. 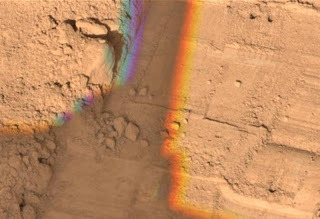 The Phoenix lander has been drilling into the Martian surface with it's motorized rasp on the back of it's robotic arm, collecting the sample with it's scoop and then watching and documenting the whole procedure kind of like a dress rehearsal in preparation for an actual gathering and depositing in the lander's oven when they are hoping they will finally be able to get some of that ice water into an oven to scientifically conclude ice water on Mars. 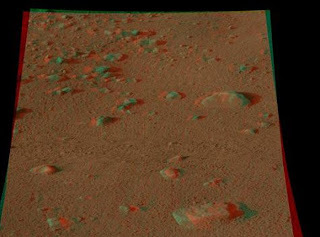 Okay now for the exciting news, NASA just released some 3D stereo views of the Martian surface around the lander. You've heard me talk before about my cardboard 3D glasses, people mock me for wearing them, actually I'm wearing them right now as I type, and yes It isn't the easiest thing to do, type while your wearing 3D glasses, but boy is it ever cool, may not look cool, but the view of the images with these glasses is, well it's like you're there, get yourself some of these glasses, you'll never regret it. Before I got my professional ones I had made some up by buying blue and red gels and taping the cut out squares to my glass lenses, word of advice, you may want to do that in private, it's not like people will think anything less of you when they see you wearing them, it's just they probably won't think anything more of you. 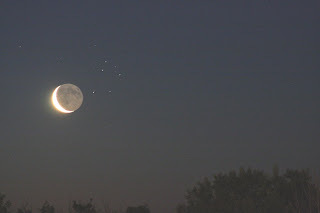 I'll leave you now with an animated Lunar Pleiades Occultation. Got a call from a nice man, Doctor Tony at 1:00 am Saturday morning. "Hi this is Doctor Tony Phillips calling with a space weather alert. A geomagnetic storm is in progress. 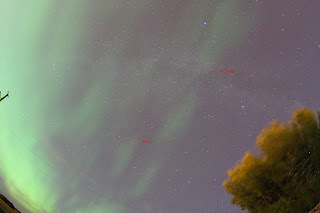 The interplanetary K index has increased to a value of 6 which means auroras are possible in your area now. Be on the lookout for northern lights. 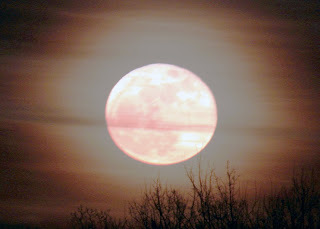 Please check Space Weather dot com for further updates and more information." 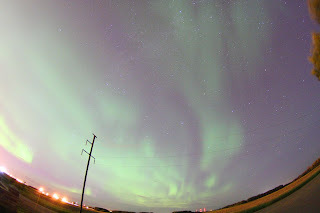 We like Dr. Tony, because of Dr Tony I was able to capture some wild and crazy Auroras, they covered the whole sky. I signed up with SpaceWeather.com to send me updates on any unusual space weather events when ever they occur no matter what the time, since I am on call 24/7 I figure , hey why not. At the beginning of the summer I just went to Spaceweather PHONE, signed up and I was ready to go. They have called 2 times before, both times it was cloudy, 3rd time a charm. 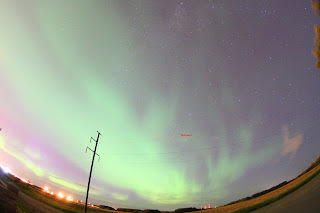 Even got my images on the front page of SpaceWeather.com for a couple days, you can see them in their gallery here. It was a beautiful night, calm yet so much going on, besides the auroras there was the Milky Way and meteors, time to get lost in the moment and reflect on the magnificence of the night sky. Auroras are created by the dangerous solar winds interacting with our protective magnetosphere, most of the solar wind's dangerous charged particles are forced away from us by our magnetosphere, but some particles do get through to be trapped in the magnetosphere and upper atmosphere where the collide with oxygen and nitrogen atoms, the spent energy of the collisions are turned into harmless light creating the various colors of the auroras. I'll leave you now with a clip of some of the images I took that morning, I figured out how to put music to my clips, took me forever, but I got it figured out, see what I had to do is in Vista movie maker right under where it says import images, it says import audio, duh, I hate reading instructions. 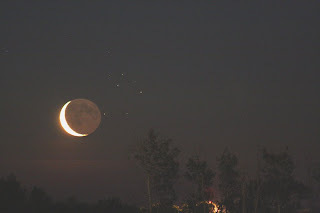 Saturday July 5 just after Sunset there was a real pretty celestial gathering of Saturn, Mars, Regulus and the Moon and almost all in a straight line, very nice. Getting a little antsy here, running out of major conjunctions to watch for, the next one isn't till August 2, 30 minutes after Sunset if you look low in the west you will see Saturn, Venus, Regulus and the crescent Moon all gathering, further off to the right you will also see Mars, technically not in conjunction with, poor little Mars, kinda in a wannabe conjunction, I'll make sure to get Mars in the image with the rest of them. Recipe for one Hubble size telescope mirror, 130 pounds of epoxy, 3 pounds of carbon nanotubes, one gram of aluminum, oh yea, and 1300 pounds of lunar dust. NASA Astrophysicist Peter C. Chen has a dream to build a big telescope on the Moon with the main ingredient being Moondust. They have already successfully constructed a 12 inch mirror by using Moondust simulant, epoxy, aluminum and carbon nanotubes. With the Moon's weak gravity they are saying it might be possible to build telescopes with mirrors as large as 50 meters across, or 20 times the diameter of Hubble, that is one big scope, but that's not all folks, no, not only do you have a big scope, but on the Moon there is no atmosphere, nothing to distort the light path from far away stars and planets, because of these two facts they figure, they being people other then me, they could actually analyze the chemistry on planets around other stars for signs of life. In my dreams, to be an Astronaut, on the Moon, riding on that cool Moon buggy, to look through a fifty meter telescope, to see little green aliens on a distant planet, sigh, here I am stuck on Earth, well at least I have my cat........ and a blog. 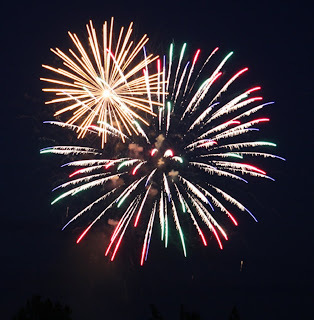 July 4 was my one year blogging anniversary and what an adventure it has been. I remember my very first comment from Mighty Morgan and what a thrill it was, first it made me think "wow, someone is actually reading my stuff", but it also made me think , "crap someone is actually reading my stuff", never counted on that. 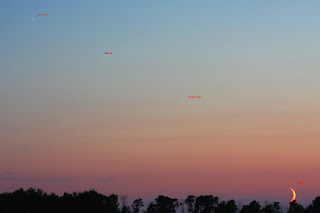 All I ever wanted to do with this blog is somehow try to put into words the feelings I have when I'm under the stars and how, if you just look up you too can enjoy what is so freely given to us, but how can I put into words, feelings I don't understand. Enter pictures, after all a picture says a thousand words, less words for me to write, cool. One thing I didn't count on was the relationships I would make along the way, different people all with their own passions and ideas on how to make the blogging world a little more interesting and fun and how they communicated them to me through their poetry, writings and images, and I thank you all for that, for I am now the learner and not the learnee, no wait... I am now the learnee and not th....., I am the grasshopper.....no,......I am.....I was.... never mind, you get my drift, I'm getting more out of this experience then I ever thought possible. People it's been a blast bringing you the most current happenings in the night sky through my imaging this past year, well worth spending countless hours under dark skies and on distant roads, and bonus I have gained some interesting experiences, most of them will never be talked of further, but filed away under "YIKES" if my wife only knew, she'd never let me out to play again. I'll leave you now with a clip I put together of some of the Canada Day fireworks we had here in Saskatoon, thought it would be fitting for my Anniversary. We had an awesome display of lightning the other night and was able to capture some cool shots. 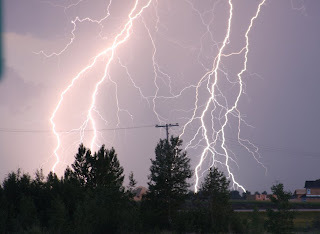 Some interesting facts on lightning, did you know for example that lightning can increase the temperature of the air around it by up to 50,000 degrees F, and that it contains up to 100 million volts? Also the leading cause of injuries in the home during a lightning storm is talking on the phone, wow, I never knew there was such a category, what is going on in people's minds? "Wow, cool thunderstorm, think I'll make a phone call and then take a bath." Having said that I thought I would post one of my wide angle shots of lightning, what was I thinking? 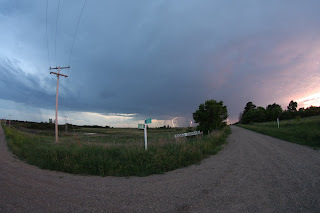 Most lightning injuries occur in the spring/summer when a lot of people are out doing things like, swimming, golfing, biking, taking pictures of lightning in a wide open space under power lines, ect. If you hear thunder you are within 10 miles of lightning and you could be struck, seek shelter! You should avoid situations in which you may be vulnerable, like being under power lines, at the end of my photo shoot there was rain, lots of thunder, lightning, hey I don't have just one guardian angel, I got a group of them tag teaming. A quick update on the Phoenix Lander, apparently the lander had some ice water rich soil in it's latest scoop, it was to be delivered to it's optical microscope Thursday and if there was any left over the rest was to be delivered to one of it's ovens for analysis to be done next week. Scientists and engineers are thinking this could be the last chance to use the lander's ovens due to the fact one has developed an intermittent short. Whenever they deliver a sample to the ovens they have to shake the ovens to get the sample into them, no shake no sample to analyse, if oven number 4 shorts out again and causes the other ovens to stop shaking before they get a sample into the target oven number 0, they are not going to be able to perform any tests on the soil, if they get a sample into the oven and then oven 4 shorts out, they can still do tests, apparently the short doesn't effect the oven's abilities to analyze the sample once it's made it into the oven. I'll leave you now with some shots of lightning I took a few days ago. 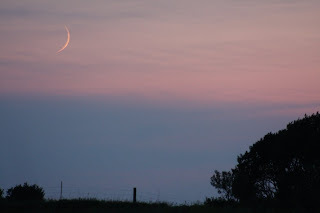 Mentioning the word conjunction to me gets me excited, mention the word occultation and I go into a frenzy, and that's what happened here in Saskatchewan at 1:50 am June 30, 2008. The crescent Moon complete with earthshine covered two of the Pleiades stars, Atlas and Pleione, doesn't get much better then that. 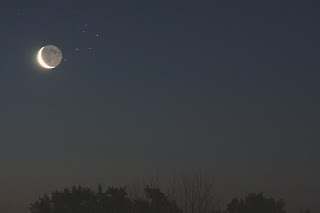 By the time the Moon rose here in Western Canada the occultation was to be over, some astronomy sites had the exact times when the Moon would be occulting every star in the Pleiades for Eastern North America, but nothing for Western Canada. 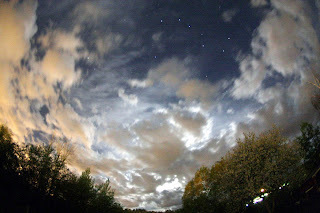 You can see from the above image the two stars now uncovered that were once occulted by the Moon. Pictures and words just don't do it justice, I wish I had you all here at that time, sure it was at two in the morning but the busy quiteness of the early morning sky was just too beautiful to keep to myself. It was kind of odd, the brownish crescent Moon with the Pleiades looked surrealistic, as I stood out there all alone with my sky chart, like a treasure map, I felt so lucky, like gazing on a found treasure for the first time. I took lots of images to pass along the event to you. Below is a clip I put together of 54 images over 10 minutes actual time of the Moon Pleiades Rise. If you look closely you'll see Atlas being uncovered near the end of the video clip, look to the bottom right of the Moon.